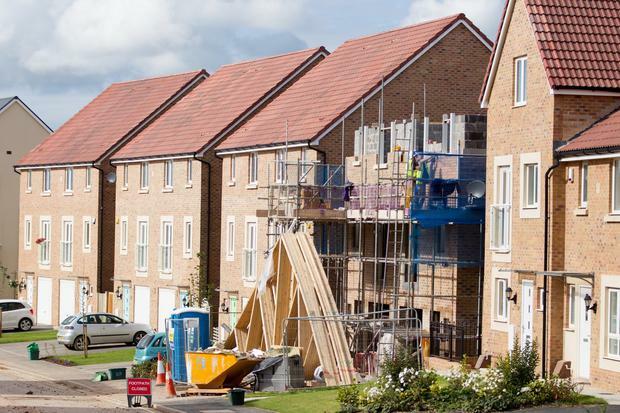 Almost 15,000 new homes were completed last year, the largest number since 2009. New figures to be published by the Department of Housing today will show that while the construction industry is slowly getting back to business, the market is still a long way off what is considered normal. The second quarterly report of the Government's housing strategy, 'Rebuilding Ireland', shows that 14,932 new homes were completed during 2016, an increase of 18pc on the previous year. However, it is estimated that around 25,000 units are needed every year to restore the market to a healthy level. Of the homes completed in 2016, some 6,289 were in the Greater Dublin area and 8,643 across the rest of the country. Planning permission was granted for more than 16,000 new homes in the year to end September 2016, an increase of 45pc on the preceding 12 months. And 21 local authorities have applied for funding under the €200m Local Infrastructure Housing Activation Fund (LIHAF), seeking to open up more of the 17,434 hectares of land for development that the planning process has identified nationally for housing, 2,654 hectares of which are in Dublin. These applications, which have identified 74 separate projects, are being assessed with a view to making funding decisions in March. The report notes that, while there is "an encouraging trend", the figures also underline "the continuing challenge that faces the State, housing providers, funding institutions and all other relevant stakeholders in terms of adding to the momentum now in evidence so that housing delivery reaches the target level of 25,000 homes per annum in the shortest possible timeframe". In 2006, developers built more than 93,000 units but this figure had plummeted to just 14,602 by 2009. The report notes that there has been an increase in the overall number of people experiencing homelessness, since the launch of Rebuilding Ireland. But it says this is "an on-going reminder of the imperative for action". The number of people who are in State-funded emergency accommodation overseen by housing authorities in December was 4,643 adults, and there were 1,205 families, with 2,505 children or dependants. "While there have been ongoing increases in overall levels of homelessness, it is important to recognise the significant work being done by housing authorities and their delivery partners in the approved housing body sector in providing solutions," the report states. In excess of 18,000 households/individuals had their social housing needs met in 2016, ahead of the target of just over 17,000. As part of this overall delivery, the State built, purchased or refurbished some 5,300 homes in 2016 - around 1,000 over the target for the year. 12,000 HAP tenancies were created last year. 1,100 families were accommodated under RAS. In a foreword for the report, which has been seen by the Irish Independent, Housing Minister Simon Coveney says: "The Action Plan is only six months old but already important signs of progress are emerging. "I expect these trends to continue and accelerate over the course of 2017 - the first full year of implementation of the Plan - but that can only happen if we continue to collectively put our shoulders to the wheel in tackling the greatest challenge our country faces."